What It’s About: Vienna (Joan Crawford) runs a fancy new saloon that is all set to be perfectly placed to take advantage of the new railroad line, unless town big wig Emma Small (Mercedes McCambridge) gets her way and drives Vienna out-of-town. At the heart of their struggle for dominance is Small’s attraction to the Dancin’ Kid (Scott Brady), a gold miner and sometime crook she professes to loathe while the Kid woos Vienna. When the Kid and his friends are charged with a stagecoach robbery, Vienna stands against the lynch mob that Small leads against them…but can even a character as strong-willed as a Crawford character can be hold out against an entire town? 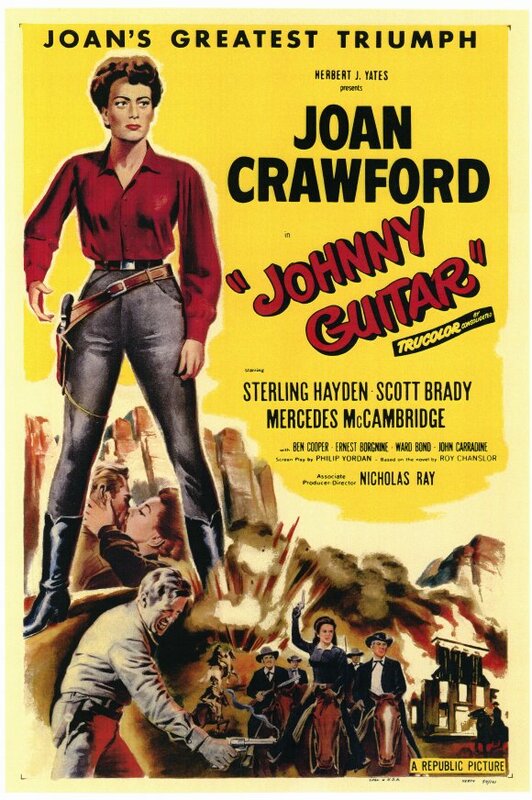 What of her new guitar player, Johnny Guitar (Sterling Hayden)…how are they connected and is he really just a guitar player? Why Watch it Today? Nicholas Ray, who directed today’s movie, was born on this date in 1911. Ray gives today’s film a distinctive, bold look that fits its Western melodrama plot very well. Crawford is at her usual high intensity and is supported by an able cast of Western character actors, making this a must see melding of different styles. This entry was posted in Adaptation, Based on a Book, Camp, Drama, Melodrama, Movie of the Day, Period Film, Revisionist Western, Western and tagged "the railroad is coming", attempted lynching, bank, bank robbers, bank robbery, bar, bartender, Cult Film, double cross, Ernest Borgnine, gunfighter, guns, Joan Crawford, John Carradine, lynching, Mercedes McCambridge, mob, National Film Registry, Nicholas Ray, Paul Fix, Peggy Lee, railroad, Republic Pictures, Royal Dano, saloon, Sheb Wooley, stagecoach, Sterling Hayden, Ward Bond.